Scuff-X from Benjamin Moore has captured the interest of a fair few decorators in the UK. Ron Taylor Traditional Painter for Warwickshire has been putting it through its paces over recent months. These are his findings so far. Following that is my Traditional Painter take on one of the manufacturers’ claims about Scuff-X features. 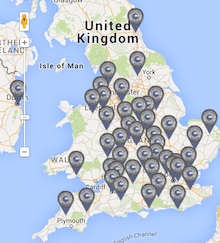 Benjamin Moore are a relatively new name on UK shores. Well known in the US and Canada it wasn’t until Shaw Paints started importing their paint a few years ago that we got to try the products here. The brand has gradually been gaining popularity here due to the excellent performance of their core products. The superior application and opacity of the paint puts them at the forefront of paints currently being sold here. The excellent service and knowledge of the staff at Shaw’s is an added bonus. 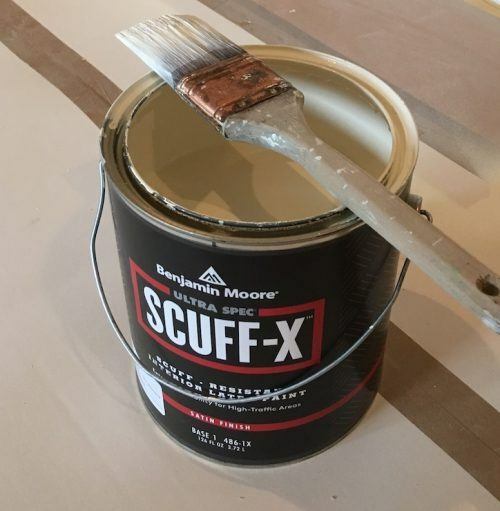 I haven’t been disappointed with any product I’ve used from Benjamin Moore but the recent introduction of the Scuff-X durable range of paints for walls and woodwork seems to have moved the goalposts for performance of domestic acrylic/latex paints. That’s no small claim and one that could come back to haunt the company. But whatever the marketing says, to date this is quite simply the best trim paint in a single can that I have ever used. We have brushed, rolled and sprayed many gallons of these products in recent months and the finish has blown away our customers and us. Finishes apply superbly with a quality synthetic brush such as the Corona red/gold range. You need to move quickly and apply liberally to allow brushmarks to flow out. The addition of a little Benjamin Moore latex extender certainly helps on occasion to aid flow. The same outcome is achievable if you roll the product. Rolling requires a microfibre roller to spread the paint fast. There’s no need to spend a fortune on rollers though and we’ve had excellent results from Fossa short pile 4” microfibre sleeves. There’s some stipple when applying, but the finish tightens up and levels as it drys. As good as these products are with a brush and roller it’s when they are sprayed through an airless sprayer that they come into their own. On cabinetry and trim the finishes that can be achieved are on another level to anything we’ve used before. 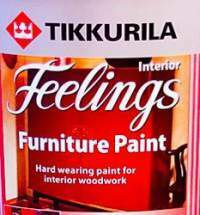 Yes we’ve got great finishes with other products from Tikkurila, Mylands, Farrow and Ball and more, but nothing comes close to the smooth, hard, durable finish these paints achieve. Spraying Scuff-X Eggshell and Satin are no exception. The products atomise well at lower pressure with both the new Graco FFLP and the Tritech Ultra. My preference is for the Tritech tips as they apply slightly more paint but there’s not much in it. Good cling to edges and a resistance to run make them ideal for tricky pieces of furniture and cabinets. Not very often does a new product come along that can honestly be called a game changer but at this stage 4 months in, I feel this range exceeds all expectations. You can scratch it but you have to try very, very hard to do so. Modern day wear and tear won’t touch it. I slid an almost empty metal tin repeatedly along a sill I’d painted and it never marked. It’s easily as good as any water based kitchen lacquer we’ve come across. The finish, even of the Eggshell, is super smooth. Scuff-X from Benjamin Moore is extremely hard wearing but is it really like a 2-pack paint in a single component can? Benjamin Moore pitch Scuff-X as 2-pack performance in a single pot of paint. That is quite the idea! Ron’s findings so far do indicate it really is an advanced “one-pack” waterbased latex paint. To help painters decide whether Scuff-X is in the same ballpark as a 2-pack paint, I will go through how we determined the performance of a water-borne 2-pack polyurethane paint that can also be brushed, rolled and sprayed to perfection. To start off, let’s take a look at what 2-pack paint is and then work out how the two paint technologies measure up. In simple terms, Scuff-X is a one-pack paint. One-pack paints are what most of the population know as paint – it comes in a tin from DIY stores and trade centres; we paint walls, woodwork and metal with it. On the other hand, 2-pack paints come in 2 tins from specialist trade centres, and the commercial and industrial grade products. 2-pack polyurethanes are used on cars, trains, planes, oil rigs, as well as commercial furniture, and in critical installations. A conventional one-pack paint comprises a binder, pigment and oil or water solvent plus colourant, all formulated and mixed together in one tin. Give it a good shake, pop the lid and start painting the prepared surface. Two-pack paint come in two tins! You have a pot of “paint” to which you add a “hardener” which you might also know as an accelerator or catalyst. You need clean measuring pots and stirrers and should follow the recommendations exactly for measuring out accurate proportions. No drop of this, and a splash of that! Once mixed, the paint is ready to apply. One-pack paints air dry (either via evaporation, oxidation or coalescence), and take from 14 to 28 days to cure fully, at which point they are at their maximum performance level. A 2-pack polyurethane paint dries chemically and would usually be fully cured after 7 days. Conventional one-part furniture enamels tend to be very durable compared to conventional trade gloss or eggshell. One-pack (emulsion) wall paints can be formulated to be scrubbable. In comparison, 2-pack paint is specified for very harsh environments and high traffic areas where even the best “normal” paints are not fit for the intended purpose. As an example, the 2-pack polyurethane we tested reduced maintenance costs for the walls in a hospital by a factor of 8 compared to a “diamond” type emulsion. In my experience, 2-pack paints tend to come in practically any sheen level. The 2-pack polyurethane referred to here started from 10% and went up in 10% increments to 93% gloss sheen levels. And to all intents and purposes, there is little difference in durability from matt on up. One pack paints tend to come in 3 sheens and the shinier the finish the more durable it is. Skilled professional painters and decorators using one-pack paints have a good level of product knowledge and understand how surfaces should be prepared and paint best applied. Ideally pro painters know drying times, and ideal ambient temperature ranges too. They should also know the exact wet film thickness of each coat, so that it dries back to the required dry film thickness as specified by the manufacturer in data sheets… No? Yes they should! When applying 2-pack paints, painters need to understand mixing, micron thicknesses, application methods and great a deal of health and safety. (Some 2-pack polyurethanes contain isocyantes and need careful handling.) It also pays to avoid any assumptions that 2-pack paints behave like one-pack paints. Using 2-pack paint is an altogether more serious business, so if you can get 2-pack performance in a single can of paint, go for it! All Traditional Painters have a depth gauge somewhere in their kit box and know how to use it. But judging by the reaction at Elcometer, it is probably fair to say very few residential decorators have purchased a depth gauge. Measuring wet paint thicknesses is simple with a depth gauge. If you don’t apply paint at the right thickness, you cannot expect to achieve the performance promised by the paint manufacturer! If you dilute paint by 10% you need to apply 10% more paint to achieve the required final dry film thickness. Determining dry film thicknesses is the stuff of labs, so to deliver as promised, read the data sheet and measure the coatings when wet. With a standard pot of one-pack emulsion or gloss paint, you pop a lid, and maybe ease it with “a drop or two” of water/white spirit/extender. When it feels right, start painting the prepared surface with a brush, roller or spray. The paint may thicken if exposed to air or heat or draughts, but it doesn’t go off, as such, just becomes more difficult to apply. 2-pack paint on the other hand comes as a 2-component pack which needs mixing in specific ratios. End users would be very foolish to ever try mess with the paint mix, beyond adding the prescribed thinner – nothing apart from what is prescribed, will do! The mixed paint must be left to satnd for a few minutes before applying. And it also has a pot life, which means it has a limited usability window before it becomes literally too hard to use, or loses its potency. 2-pack paint has a pot life when mixed, and you better know what it is! To get a better idea of pot life and preparing 2-pack paint, picture 2-pack car body filler. You have a big tub of paste which is good for nothing on its own, and a small tube of hardener that serves no purpose on its own either. Mix them together in specified proportions, and you create a high performance filler that is ready to use and is likely to dry very very hard. You have to use it up within a certain time scale, between a couple of minutes and a few hours, before it hardens beyond usable. Likewise, the 2 components of say a 2-pack polyurethane paint are mixed together following precise ratios. The mixture will look, feel and apply just like a normal paint during its pot-life. It can remain usable for several minutes to several hours, depending on its formulation. Once past its pot life a good 2-pack polyurethane stays fluid so kit can be cleaned, but the chemical reactions cease and the paint mix loses all its intrinsic properties. “Exhausted 2-pack paint” may never dry or it may dry but never deliver expected levels of durability or resistance to liquid spills. In effect beyond its pot life it is useless and mixed old paint works out expensive! Have a notebook and alarm clock handy if you want to stay efficient and consistent. Once applied, waterborne one-pack acrylic latex paint dries quickly so surfaces can be gently handled in a matter of hours. It then takes 14-28 days to dry throughout its thickness ie cure, at which point it reaches its full potential for hardness and resistance to wear and tear. A waterborne 2-pack polyurethane paint will dry very quickly too. The coating is soon dry to the touch and appears hard, but the chemical drying process continues for about 7 days. At that point the chemical reactions stop and the coating is fully cured and it is at its full potential. What is the performance potential of one-pack acrylic versus 2-pack waterborne polyurethane? The chemistry indicates that there is no one-pack acrylic paint tougher or more chemical resistant than a 2-pack polyurethane paint. So BM are entering new territory if the capabilities of their one-pot paint really matches those of a two-pack paint. But you know, rules are there to be broken. There are a few criteria to test how good a paint is. It is perfectly feasible that with modern technology Scuff-X could offer a very high resistance to scratches and abrasion compared to other conventional furniture paints. And at this time, not marking with a metal tin being dragged repeatedly over a horizontal painted surface, that is a very good indicator of high scuff resistance. You have to wonder what other paints would stand up to that treatment. But is Scuff-X from Benjamin Moore comparable to a 2-pack water-borne polyurethane? How scratch resistant is a 2-pack polyurethane paint? In the scheme of things, VERY, RIDICULOUSLY scratch resistant. Traditional Painter members tested a fully cured 2-pack brush-applied polyurethane furniture paint. It proved more scratch resistant than Ikea laminate. With one coat of clear lacquer on top, even attacked aggressively with keys and knives, it was all but impossible to leave anything more than a light scratch. Marks were only barely visible, if looked at from the right angle. By all accounts the satin 2-pack coating applied on a ceiling blunted an electrician’s Skilsaw blade. The same degree of mis-treatment was meted out on Helmi 30. Among its many good features, Helmi is definitely tough compared to most other one-pack paints for woodwork. We regularly use it with confidence on kitchen cabinets, but when attacked with knives and hammers, no surprise, Helmi 30 dies a horrible death. How does Empire compare? Tikkurila’s oil based satin-matt enamel resists wear and tear even better than Helmi, but the 2-pack polyurethane was deemed a completely different animal, like chalk and cheese etc. In terms of scratch resistance, at this point, it seems fair to say that Scuff-X performs somewhere on the scale between the best one-pack and best 2-pack paint. Your mileage may vary. The above scratch tests were not conducted in a lab. Although care was taken to be consistent and the aim was to provide a fair and real world demonstration of the durability of the respective paints, it should only be taken as an anecdotal comparison. In other words, scratched by hand, we can give an opinion. However it is not possible to give accurate numbers demonstrating consistent pressure with a blade on each paint coating tested. For a scientific side-by-side product comparison, you need to run a series of scratch tests conducted in paint company labs or using official standards tests. It takes resources to take a completely measured approach. Pencil Hardness Tester (Wolff-Wilborn), Sclerometer, Clemen Apparatus, Scratching and Shearing Instrument. It would be useful to see a lab test or pencil test where Scuff-X is shown to match a 2-pack polyurethane paint for scratch resistance. Maybe Benjamin Moore have those scratch test numbers? Resistance to Indentation: There are many instruments available to assess the resistance to penetration. For coatings in particular, there are three common methods where the depth of penetration of a weighted tool is used to show the coating’s resistance to penetration: Buchholz, Barcol, Shore. Our anecdotal results were produced on fully cured 2-pack polyurethane and one-pack Helmi paint surfaces. Paint companies only make claims about paint performance based on when the coating is fully cured – at its full performance potential. Beware a claim therefore that a certain primer or paint was unmarked by a finger nail or knife blade within 30 minutes or an hour of being applied. No decorator’s paint cures within 30 minutes. – Only a shellac based paint like Zinsser BIN is going to be remotely dry in that time, and it still takes 48-72 hours to cure through its thickness. – The tested 2-pack polyurethane stops curing within 7 days. – Most conventional oil paints or acrylics still take 28 days to cure to their maximum potential. This is where Benjamin Moore’s claims of 2-pack performance in a single pot of paint really come under the spotlight. Can Scuff-X really match 2-pack chemistry? We spent many months picking the brains of the manufacturers of the toughest 2-pack polyurethane paint you ever did see. Nothing particularly groundbreaking about 2-pack polyurethane per se, they paint trains and cars and planes with that stuff and have done for a long time. However there is something rather ground-breaking about a low VOC water-borne 2-pack paint with a decorator-friendly formulation. Applicable by brush, roller and spray, it leveled to the same smooth finish regardless of how you applied it. The level of chemical resistance of the paint was off the scale!!! The same company also make a one-pack paint for woodwork that was highly scratch resistant. It was a “pop the lid and paint” product, but to rival the chemical resistance of 2-pack polyurethanes, it seems that you would have to break the laws of chemistry. Traditional Painter members tried a variety of “anecdotal chemical tests” comparing the waterborne 2-pack polyurethane paint with Tikkurila one-pack Helmi 30 (water-based) or Empire (oil-based) enamel. Try the same with Scuff-X! From memory, the only time the chemical resistance between the two paint technologies was on a par was when tested with turmeric! Let me qualify that before you get too excited. Turmeric will permanently stain stainless steel. It stained the 2-pack and one-pack paints in equal measure. Turmeric is truly terrible! You should be able to drop neat bleach on a one-pack trim paint and wipe it off straightaway with no apparent issue. All well and good, but if left to sit for any length of time, you will likely get a tell-tale white bleached mark. After 4 hours of sitting on the 2-pack polyurethane paint, bleach did leave a mark, but it was so faint, you were hard pushed to even see it. One-pack chemical resistance is useless! Apart from the above two scenarios, the one-pack furniture paint tests seemed to demonstrate that conventional paint has almost no chemical resistance whatsoever, compared to the 2-pack polyurethane paint. One false spill of the following kitchen products on any decent kitchen paint, and you will most likely be repainting a cupboard or drawer front! Nail polish or nail varnish remover Sat at the breakfast bar doing your nails is not an unusual scenario, for some. One drop of nail polish or cleaner will melt one-pack acrylic paint on contact, without even trying. Acetone didn’t mark the 2-pack polyurethane, not in a second, a minute or an hour or ever. Battery acid is a bit more extreme but it is not unusual to have batteries in a kitchen. Sat on a worktop, one could leak onto a drawer front. You can only imagine the damage to a conventional paint. The acid didn’t touch the 2-pack paint. Expect the same results with petrol, should you ever bring a leaky motorbike into the kitchen and lean it against a painted door!!!! Red wine. Back to the real world, red wine is a great drink in moderation but can be a bad influence on one-pack paint. If you were to spill a bottle on any decent one-pack furniture paint and wipe off the wine straightaway, you should get away with it. But let the wine sit for any time, or accidentally scrub it into the paint, and it will likely leave a permanent mark. Conventional scrubbable wall paint and wine? I would not fancy the chances of cleaning wine off most matt wall paints apart from the few scrub-resistant acrylic wall paints on the market. I don’t recommend it, but you can literally spill as much wine as you can afford to waste on 2-pack polyurethane 10% sheen, leave it overnight or probably till the next harvest… nothing spoilt. Apart from the first turmeric and bleach scenarios, the one-pack furniture paint tests seemed to demonstrate that conventional paint has almost no chemical resistance whatsoever, compared to the 2-pack polyurethane paint. How’s the Scuff-X looking under chemical attack? The 2-pack polyurethane paint we tested is without doubt the most advanced, toughest and fastest to apply paint system ever devised for painting new timber and repaints. 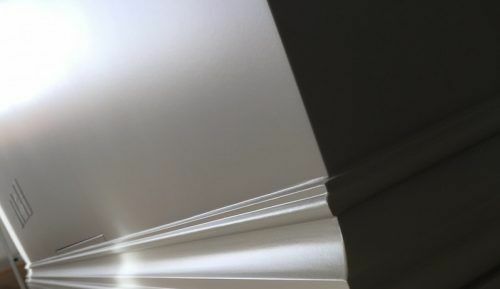 It is used on specialist decorating contracts in Belgium and Holland; it works with conventional decorating fillers and caulks, brushes and rollers; it is easy to paint over existing coatings, and once on, it is never coming off. It is in fact difficult to imagine what other painting system a manufacturer could dream up for decorators, to match its durability and chemical resistance. It would be interesting therefore to see the results on similar chemical spill tests on Scuff-X. 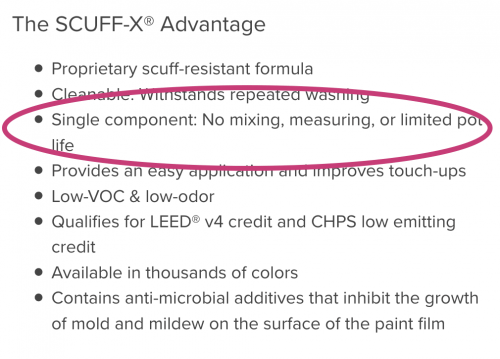 If Scuff-X were to disprove the one-pack chemical resistance rule, (fingers crossed it does)! !, then the BM team are offering near 2-pack paint performance in a single pot of paint. That would merit a huge hats off to the American chemists for their formulation, and Scuff-X could indeed be a major game changer, especially in our line of work! We would have the option to upgrade our current service of kitchen refurbishments from showroom quality hand paints or factory quality spraying to industrial quality. Kitchen manufacturers could ditch their current 2-pack acid-cat lacquers and spray-only acrylic paints, and adopt the Scuff-X system instead. 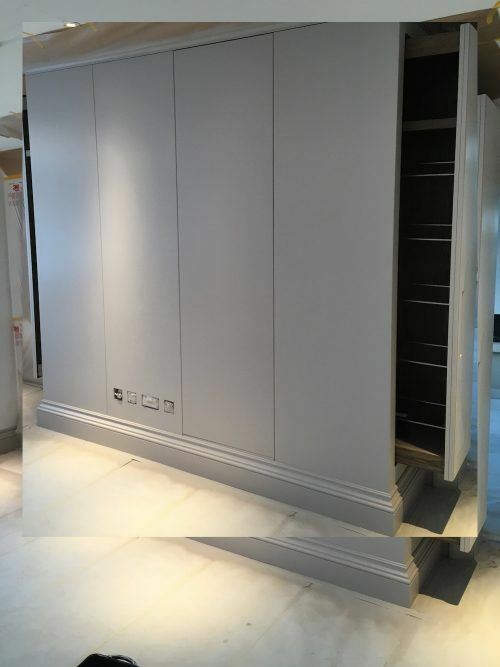 Scuff-X could be sprayed in a workshop, or sub-contract kitchen painters could spray cabinets in situ, or hand paint the topcoats, or touch up factory-sprayed cabinets by brush once the installers have left. If you want to know about Scuff-X, particularly spraying Scuff-X (or spraying anything, really) Ron and Scot are well versed in the art. They have written about spraying acrylic paint and a series of case studies and spraying info. And if you do any tests on Scuff-X products, I have no affiliation to them, but I am sure that Shaws at Benjamin Moore UK would be interested in the results. Addendum 1: How scratch resistant does a furniture paint have to be? An obvious question is, why should a furniture paint need to resist hammers and such mad levels of mistreatment? All I can say is that rightly or wrongly, “how durable is the paint?” is an oft asked question. You wouldn’t deliberately hit your car with a hammer, or deliberately run a knife blade over the bonnet, and the same goes for your living room door or painted kitchen presumably. However, if painted surfaces were accidentally hit with a sharp instrument, you might like to know how resistant the paint would be. Are we talking scratched only, chipped only or something in-between undamaged and catastrophic failure? To date, advanced one-pack furniture quality paints from Tikkurila, Alcro, Mylands and others perform very well in busy kitchens. Scuff-X might have raised the scuff resistant bar, but will it resist the odd accidental act of vandalism to the same degree as a 2-pack paint?! Addendum 2: We didn’t adopt 2-pack water-borne polyurethane paint for kitchens because? As I mentioned to a friend, in the land of the blind, the one-eyed man is king. No kitchen painter in Britain is hand painting with a higher performing paint than this, not even close. I am not aware of any decorators using this quality of paint for brushing, rolling and spraying walls and woodwork in residential or commercial scenarios either, in the UK. And neither are we, at this time! – Even if brushing or rolling, we found it requires an automotive painter mindset and you need to pay a great deal of attention to specifications. Not a problem per se, except, to work as expected every time, the paint needs to be applied in controlled conditions. It is very hard to create a consistent environment in kitchen after kitchen, house after house, throughout the year. Spray booth work is not such a problem really, as conditions can be better controlled. – You need a high level of paint chemistry knowledge to troubleshoot and perfect your work flow on site. – Health and Safety is a big consideration too with 2-pack paints. You need to be conscious of the challenges of a low VOC polyurethane paint with a catalyst which contains an isocyanate. – It is a viable system for high spec commercial decorating, as proven by our European paint contemporaries who are spraying out hotels and exteriors. However for refurbishing kitchens day after day in all levels of humidity, it seemed a leap too far. So we defer to the Tikkurila, Alcro and co paints in Addendum 1, still happily used by top end kitchen manufacturers. One-pack paint technology has come a very long way in terms of scratch-resistance, Scuff-X may have come further than most. There are other variations on 1- and 2-pack technology out there in the paint world. For instance, hybrid “2-pack” brush applied paints from Sherwin Williams. These are conventional one-pack paints to which you can choose to add cross-link binders to toughen them up more. Are you familiar with 2-pack and hybrid 2-component paints and Scuff-X? Can you see similarities or are they all like chalk and cheese? Best paint isn’t just down to out-and-out durability or sheen levels or chemical resistance. Colour matching is a very big deal nowadays when considering “best” paint brands. If you can only get a great paint in British Standard or RAL colours, the commercial market might be satisfied, but homeowners and designers are really after a much wider colour choice. So it pays to be able to deliver the best paint for a job in any colour. Tikkurila, Alcro and co seem to be able to deliver well on most counts, making them still a very compelling product choice in our main line of work. On this point therefore, we kitchen painters are curious about the deal with Scuff-X colours and colour matching. Just moved into a new place and these painting tips are helpful, thanks! I asked other Traditional Painter members for their observations specifically about BM primers and colour matching. With primers it always pays to use primer, basecoat and topcoat from the same brand, because if there were ever a technical issue, you are less likely to hear the tech support door close to the sound of “you used incompatible products”, or “we don’t have any control over the formulation of Zinsser primers” etc. And with colours, accurate matching has become a big deal in the kitchen painting world and designer-led projects. I seem to recall that in the US one big appeal of BM stores (which were more boutique than the rest) was their approach to colour. So where are BM at with colours in the UK? “I have been using all things BM for the last 15 months, all from Shaw Paints in Slough, it’s now my first choice for kitchens. Their High hide primer, water based, will hold back tannin with 2 coats and also is a very good primer for new or going over old paint, coverage is outstanding. For that extra grip then Insl-X Stix primer is the one to use, best adhesion I have found for a water based primer. They do have others but I find the two above are all I need. 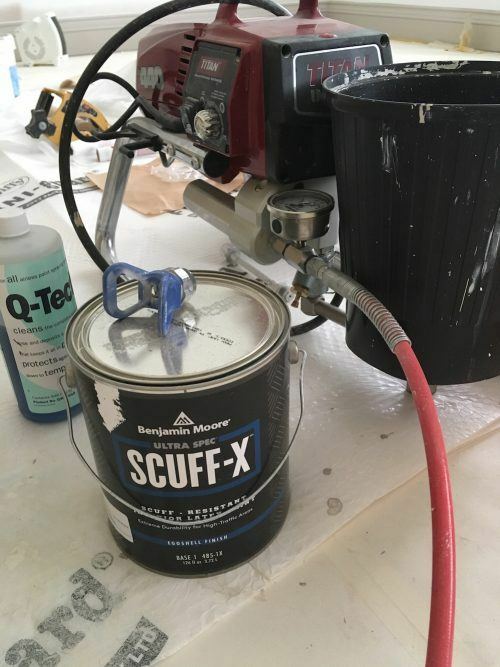 Was given some Scuff-X to try a good while ago, very impressed with the way it went on, I applied by brush, with a good open time so not needing to rush with it, coverage is very good, 9 / 10 times it covers in 2. It’s holding up extremely well on the doors I painted with any marks washing off very easily. Using it on an old Pine kitchen this week which will be a good test, as they have 3 children and 2 mad dogs. “I have also been using the BM products for around 12 months, I also still use Tikkurila products. I have found all the products that I have used from the B M range to be 1st rate. As Neil said the Stix primer does what it says on the tin as does the High Hide. The finish on their top coats is superb, flows out really well and seems to give you more open time then the Helmi top coats with no need to dampen the surface. I do normally add a little bit of the BM extender to my top coats… I would say it is the best extender I have used. The only draw back with B M is colour matching they don’t actually match colours, they use the nearest equivalent in their own range as a match. They also can’t mix Ral or BS colours which is sometimes a problem for me on the new kitchens I paint for Bells of Northampton.